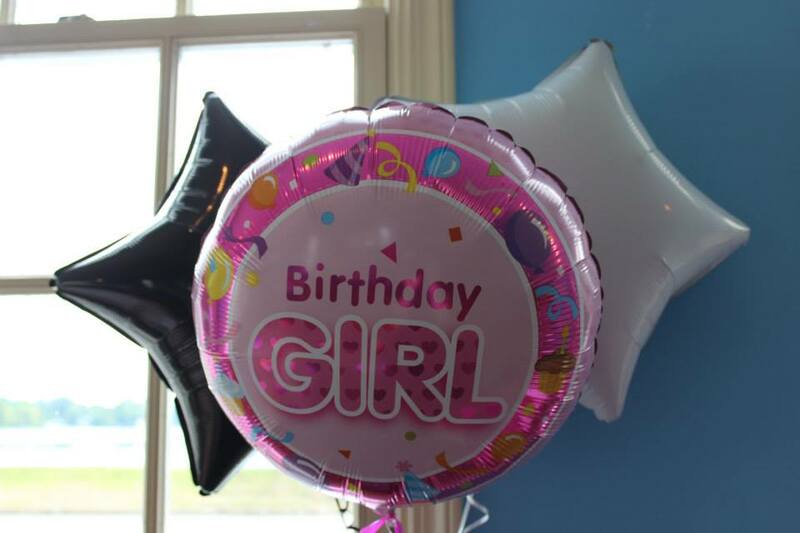 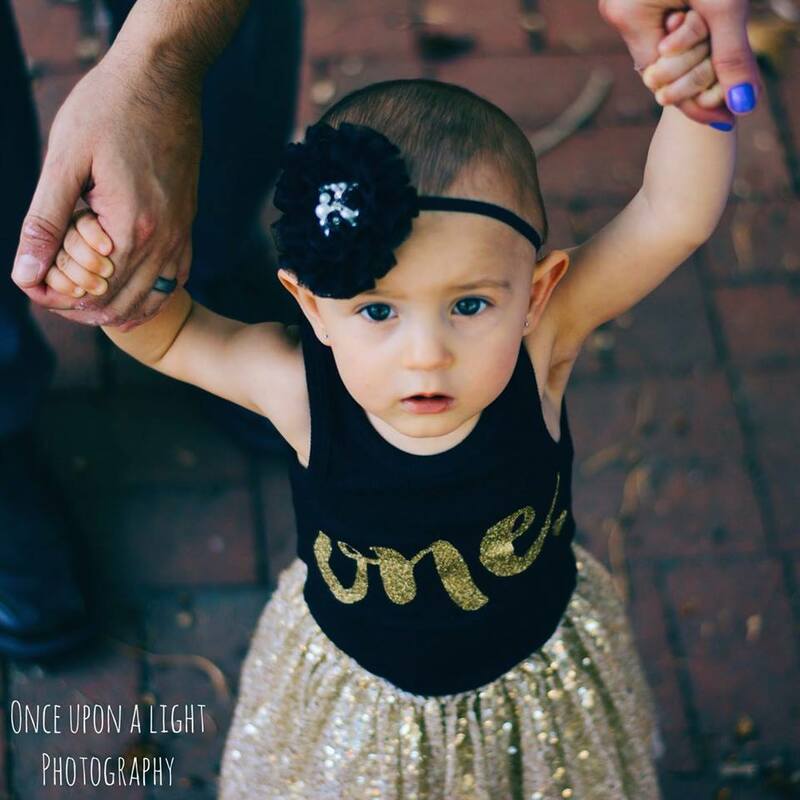 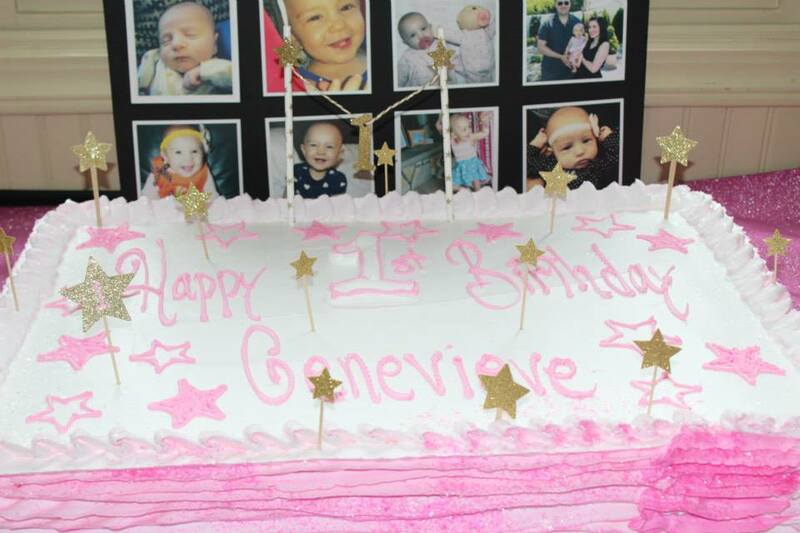 I went bold, gold and glittery for my daughter, Genevieve’s, first birthday party. 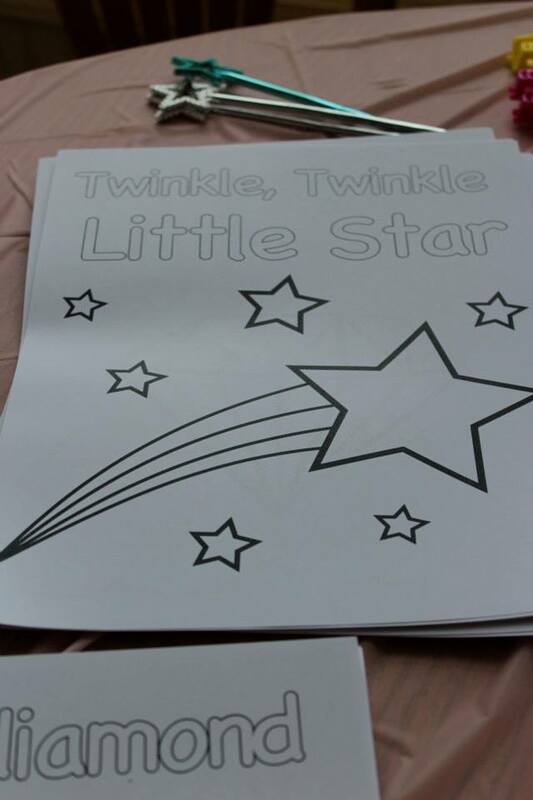 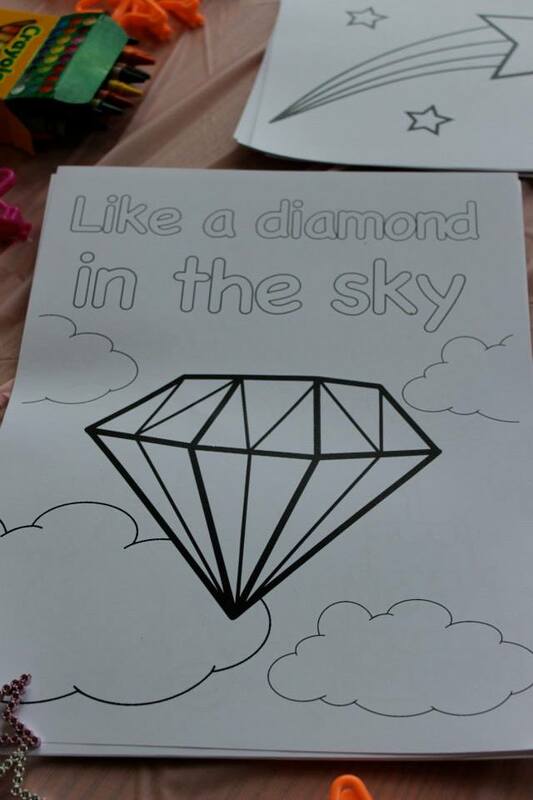 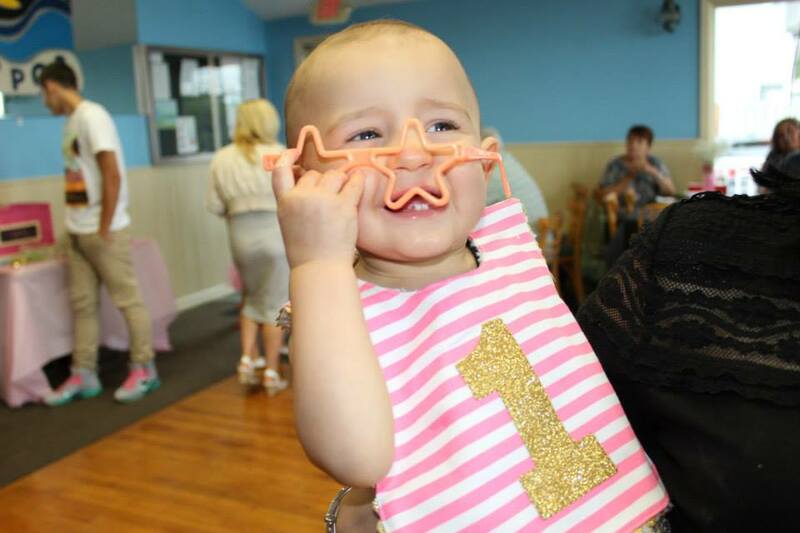 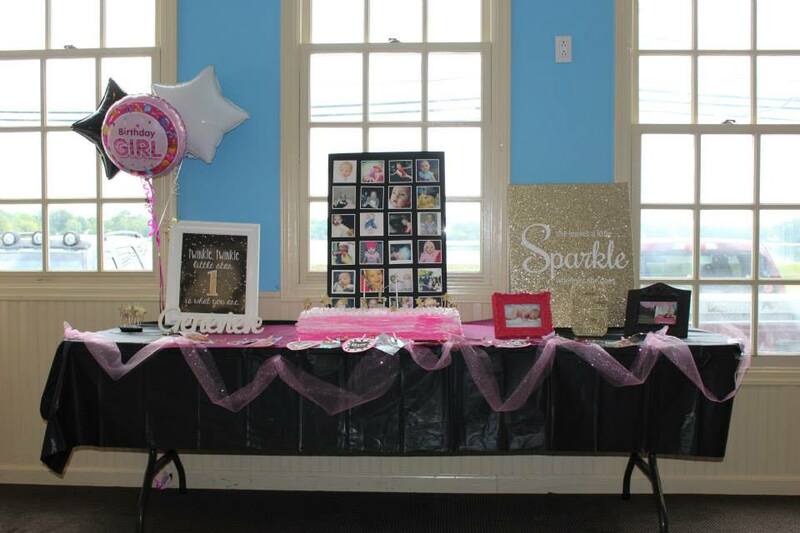 We chose a Twinkle, Twinkle Little Star theme and made sure it was evident in each party element. 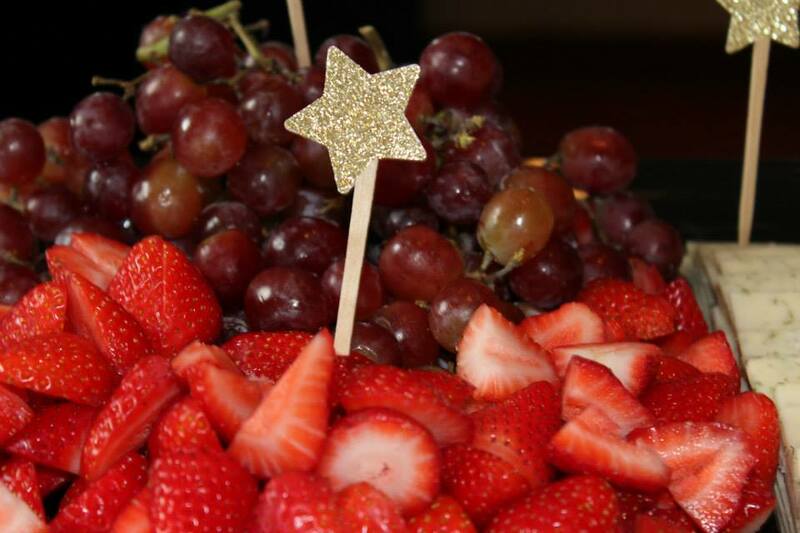 …And also used the stars to accent the food. 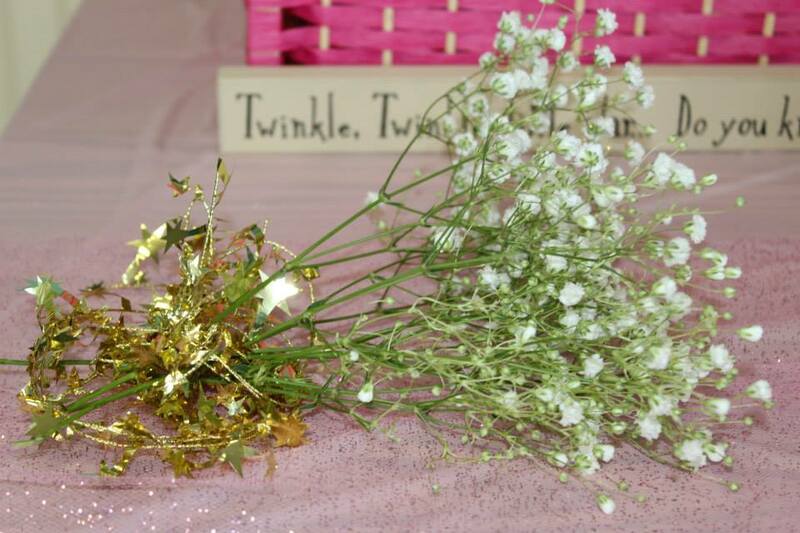 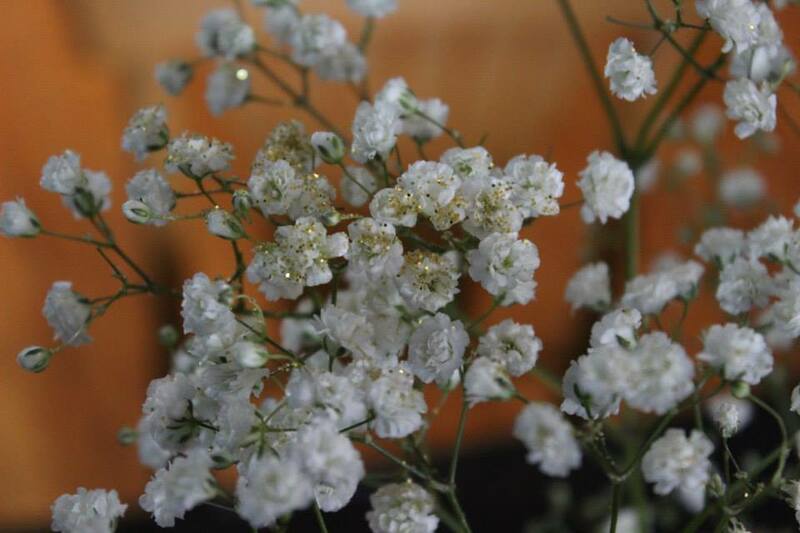 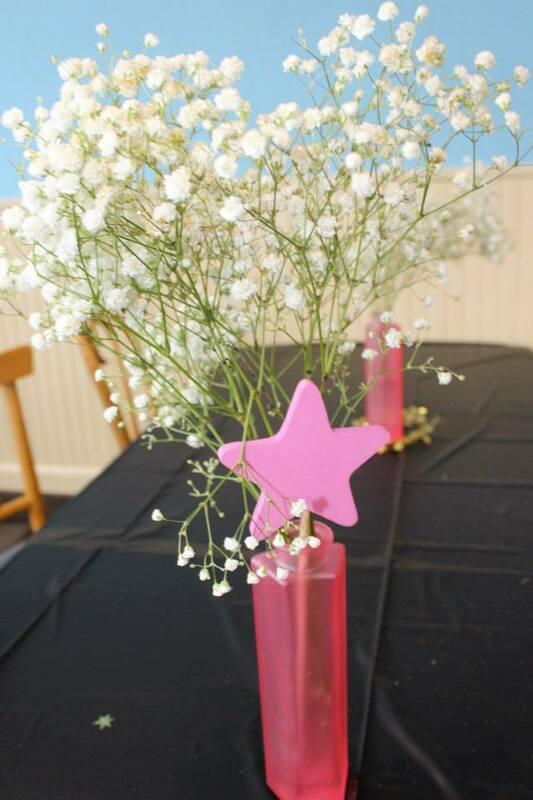 We kept centerpieces simple using adorable .99 cent vases from Ikea and adding baby’s breath, sprinkled in gold glitter. 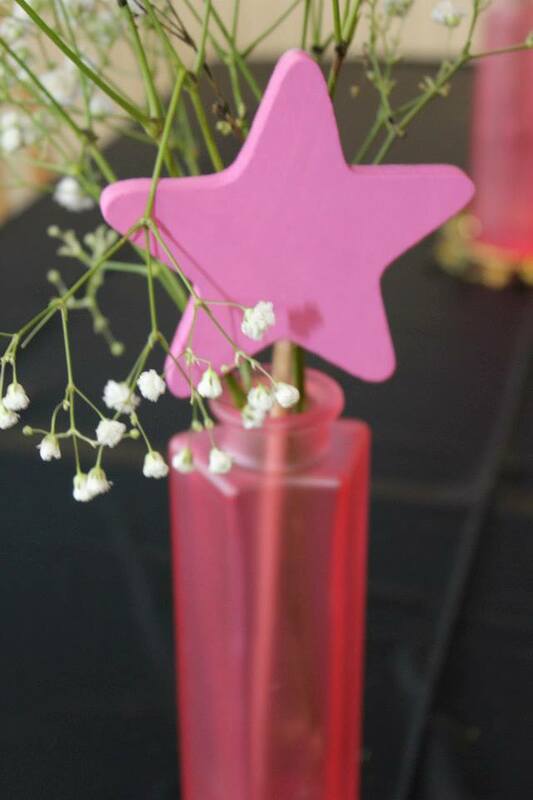 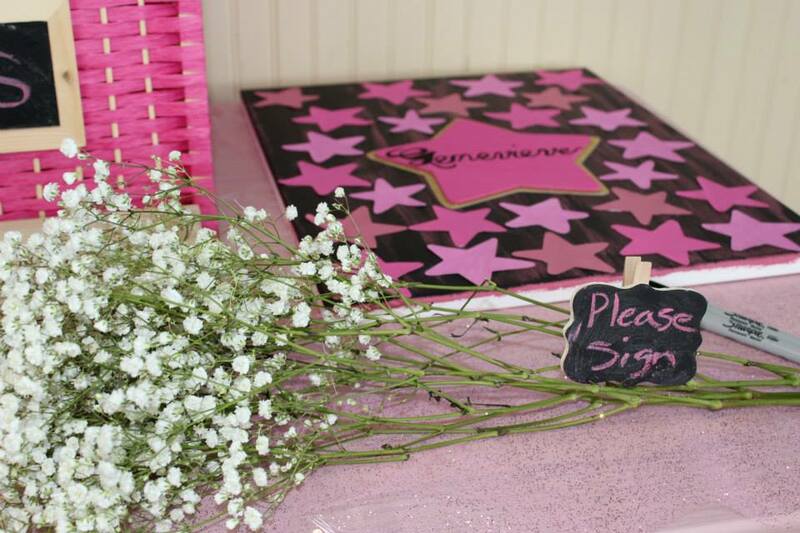 As as accent, we threw in hand-painted pink wooden stars that are now keepsakes. 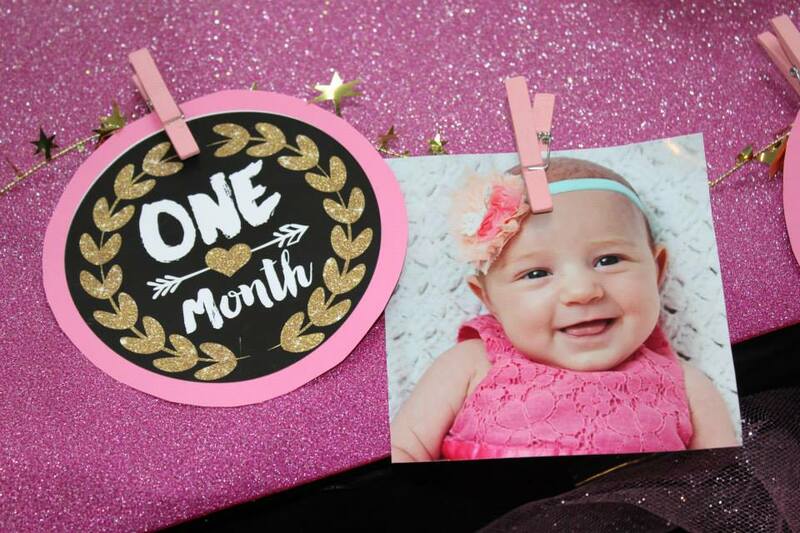 Photo collage made with images printed from Social Print Studio. 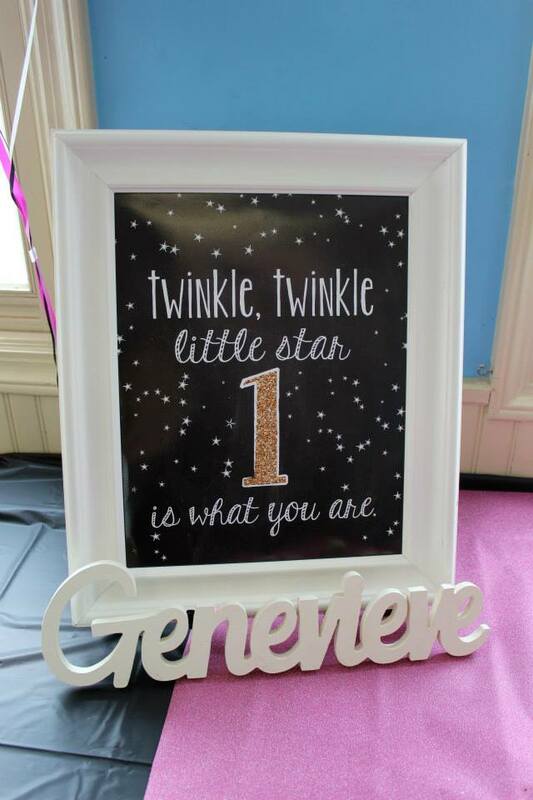 I ordered this sign as a download on Etsy, then printed and framed on my own. 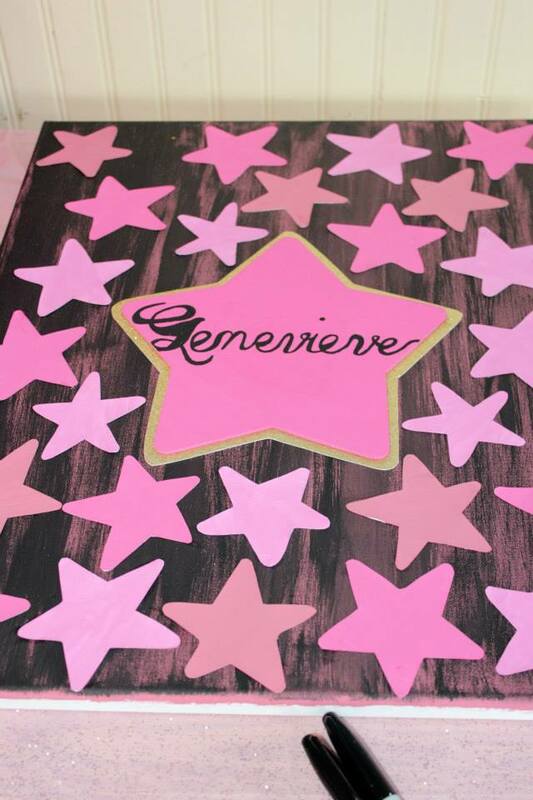 My friend made a custom canvas guest book. 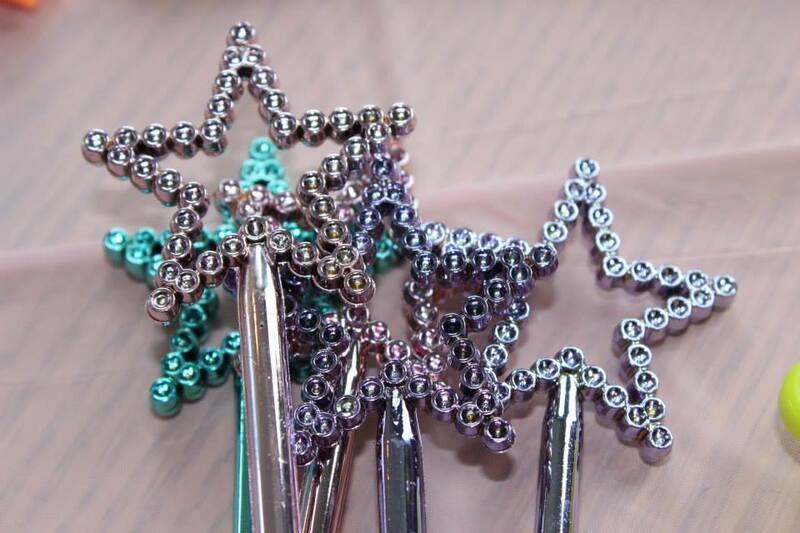 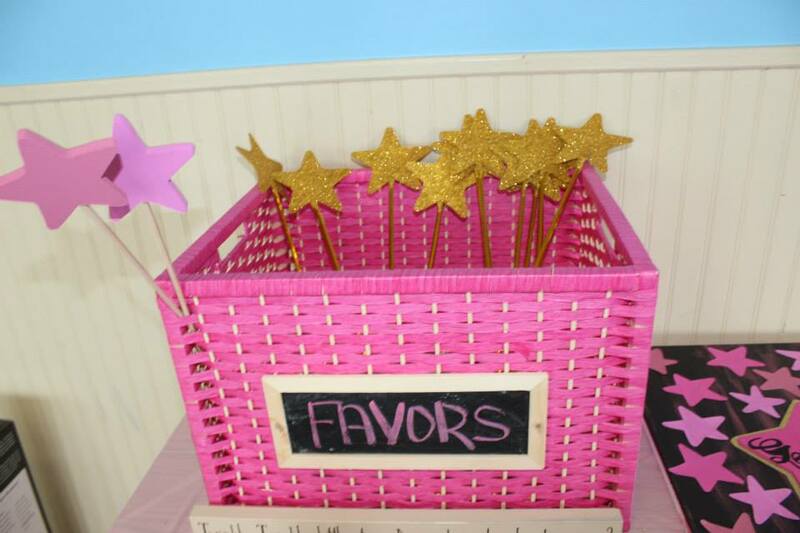 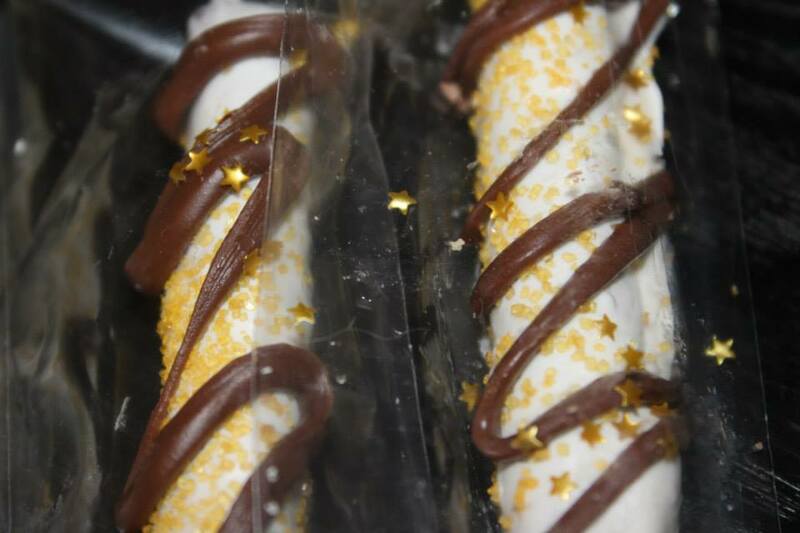 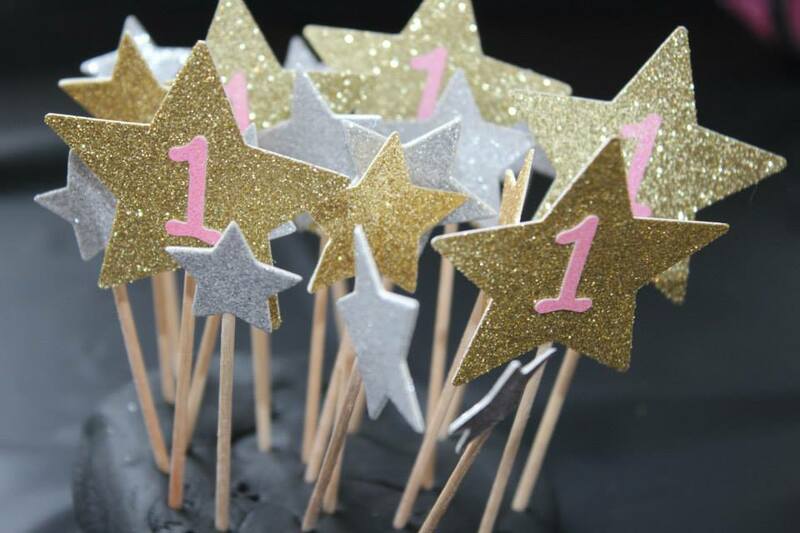 For favors, kids got gold sparkly wands from Oriental Trading and adults were treated to chocolate-dipped pretzel rods adorned with–you guessed it– gold stars! 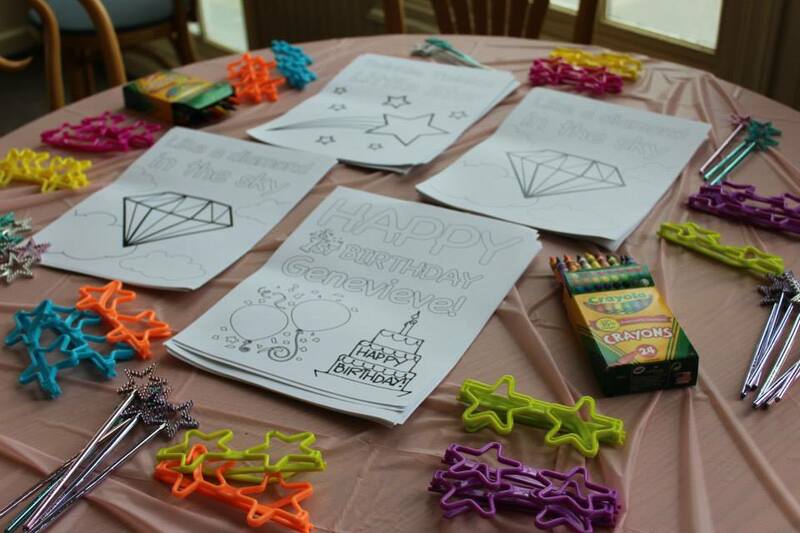 We had a table of fun for the kids. 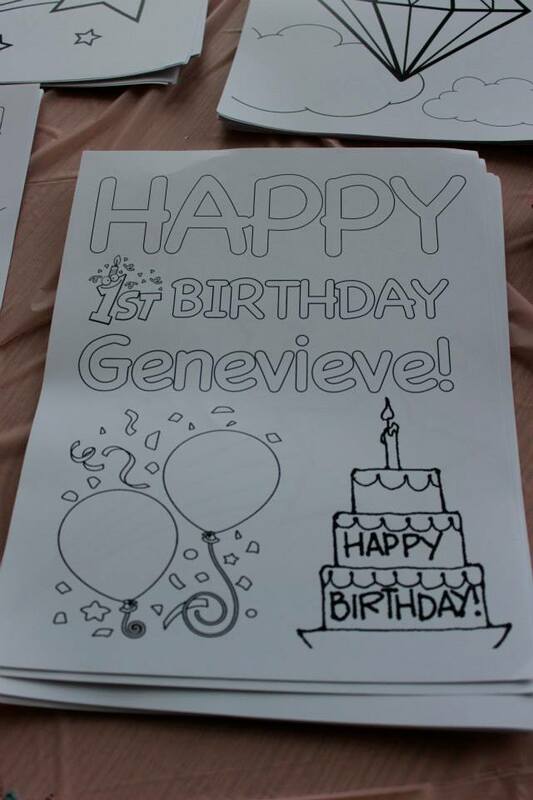 I pulled together clip art from the Internet and made coloring book pages in Photoshop. 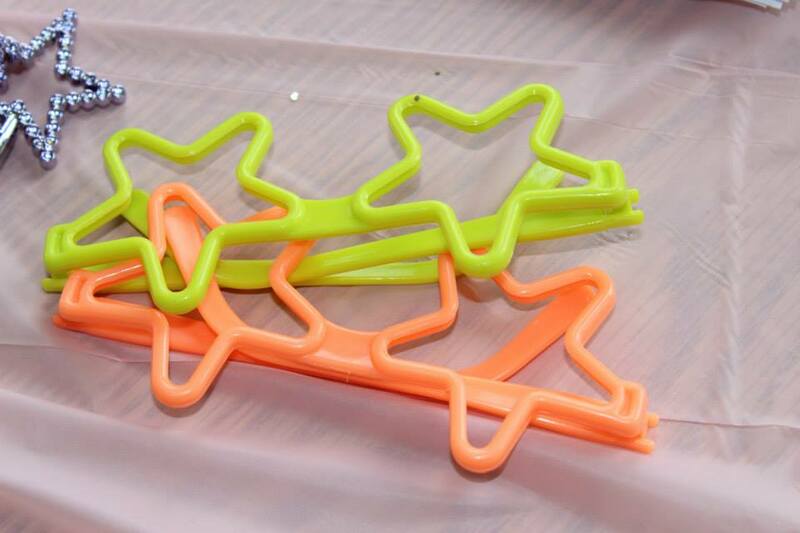 Star props from Oriental Trading. 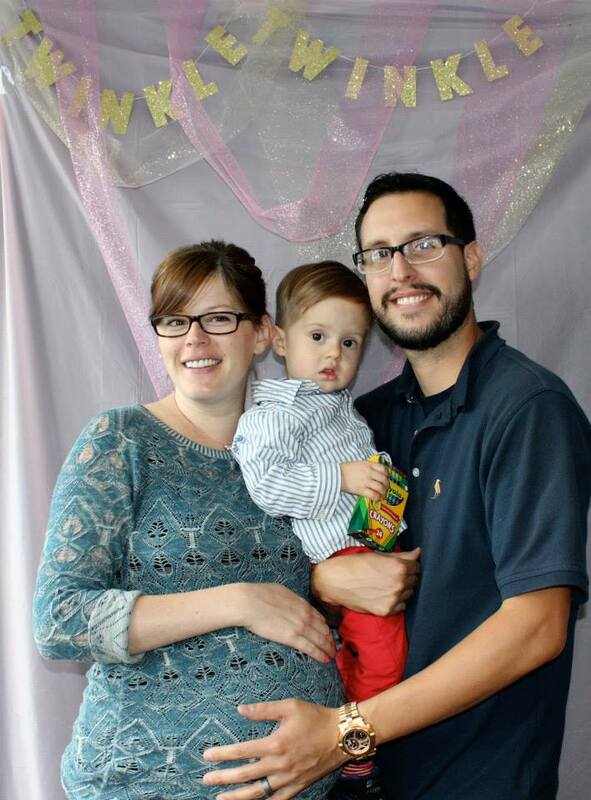 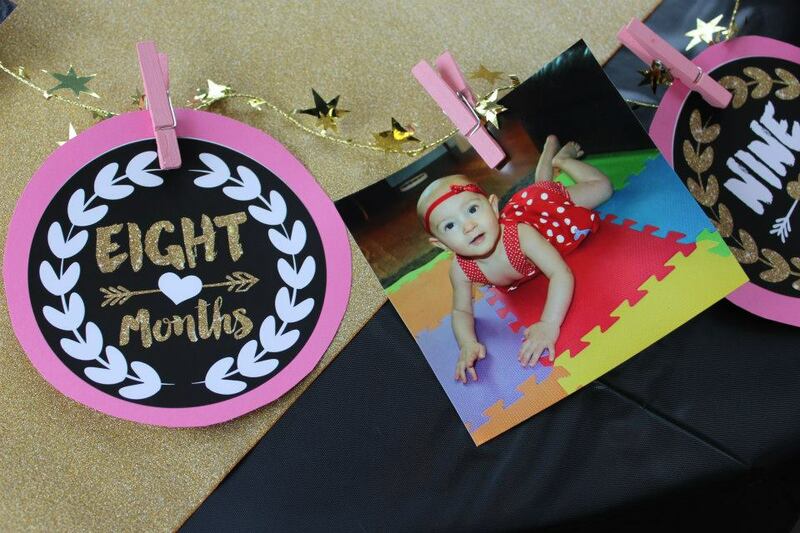 I made custom 12-month banner using gold star twine and monthly photo stickers from ShopVivaLaGlitter. 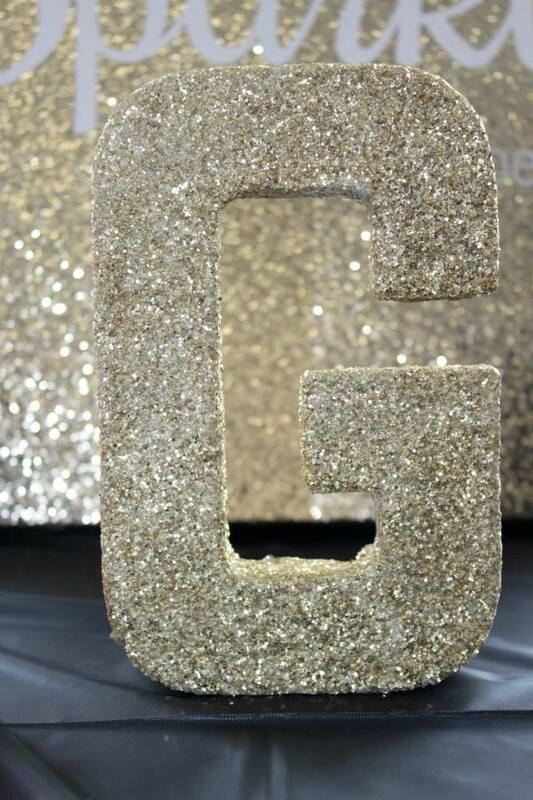 And of course, the host herself was dressed head to toe in gold glitter. 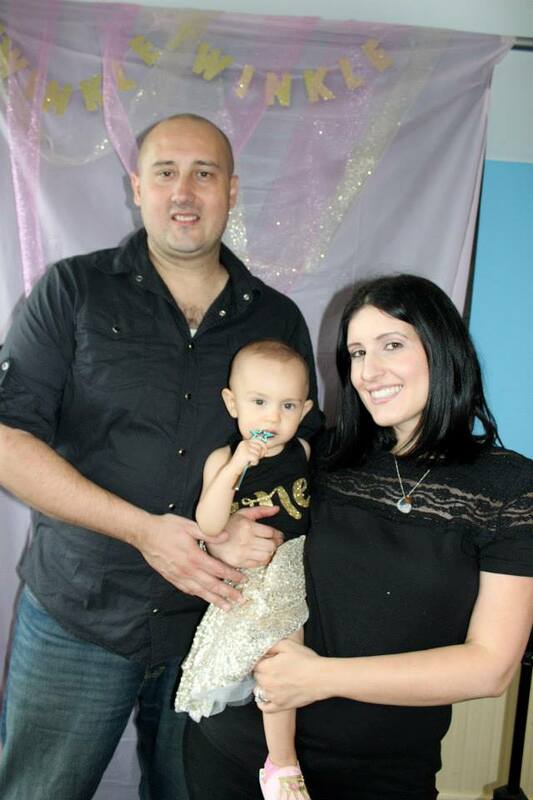 Shirt from ShopVivaLaGlitter and skirt from LolaAndDarlaDesigns.